If you mine ice in highsec, or if you just like killing highsec ice miners, chances are you've heard of the Nakugard system. It has ice and it's a 0.5 security system. That's an explosive combination. Agent DJentropy Ovaert went on patrol in Nakugard and encountered one of EVE's villains: An unlicensed ice miner named Wobble Melkan. DJentropy's alt, Zerelis Zammo, warped to the ice anomaly in an Ibis. The Ibis slowly crept toward Wobble. But the rebel miner didn't pay the Ibis the slightest bit of attention. Military historians will tell you that most "battles" are only skirmishes. But when conditions are just right, a truly epic battle can take place. This was such a battle. DJentropy warped in and popped Wobble's Retriever. It was a short, one-sided battle, but that doesn't take an ounce away from its glory. Sun Tzu says many a battle are over before they begin. Wobble was unprepared. He had some tank mods, but he couldn't resist increasing his yield with a pair of Ice Harvester Upgrades. Also, he didn't bother to activate his Adaptive Invulnerability Field. Once the dust settled, DJentropy sent Wobble a complimentary "after action report". "Well sence [sic] Concord gives me the right to Kill [sic] you I gess [sic] that U [sic] are full of crap and will keep lossing [sic] ships and standing for being a jurk [sic]"
Wobble was stubborn, like a bot macro that keeps repeating itself. He used the same Retriever fit, returned to the ice, and was unconcerned when the Ibis followed him. Clearly, this was a carebear in the advanced stages of bot-aspirancy. He couldn't or wouldn't change his ways. So DJentropy visited Nakugard the next day for a follow-up appointment to see if there was any improvement in Wobble's condition. Incredibly, Wobble was still hanging around Nakugard. DJentropy could detect no sign of improvement. At some point, stubborness must be classified as defiance. And that, of course, is a serious violation of the Code. DJentropy shook his head and added Wobble to the Red Pen list. There was no alternative. He also tried to encourage the locals in Nakugard to take better care of their own. But the miners of Nakugard were not as charitable as DJentropy hoped. Oh, this is going to be. Defiance is a serious violation of the code...YES, I have succeeded and did not even have to fire a shot!!! Killing is just a means of communication. The one means of communication they can't block. The very funny part - the "after action report" I sent to Wobble was a totally chill and cool Evemail, mentioning that had he bothered to turn on that AIF - I would have been unable to burn him down without calling in a friend for backup, and my nearest agent was over 11 jumps away at the time. "Wobble: Good fight! Way to fit a basic tank, but I noticed that you never turned on that shield hardener (the AIF in your mid slot) - I wanted to remind you that the AIF is a active module, and even if for some reason your core skills do not allow it to be on at all times, once you come under attack - you should consider switching it online. Had you turned this module online, I would have been unable to destroy you without backup, and the only backup I have is over ten jumps away." Oh well, you can lead a Wobble to game mechanics, but you can't force him to understand them. 4 times in the same system is clearly harassment. The victim should report it so code fgt can join Banned 1 in the naughty corner. The good part is - shooting internet spaceships in a game about shooting internet spaceships is not considered harassment. I have never harassed a single EVE player. I have, however, created a fair amount of emergent game play. You should consider it sometime, it is a lot of fun. You'll need to be at keyboard, of course, and you may not be able to get max yield while doing it. Oh, and Anon @ 2:46 - Don't hide behind the "fgt" spelling - just come out and show the world the caliber of your personality. We all know what you mean, you know what you mean, what's with the passive aggressive thing? Does that help you sleep better at night? If EVE has taught me one thing: the gentle carebears and poor helpless miners tend to be the most vile, homophobic, racist, sexist, and generally ignorant group of players the game has to offer. Comments like you just provided us with only server to strengthen that stereotype. Your use of the term "fgt" goes to show that your behavior and content even causes embarrassment to yourself, and this is even when posting totally anonymously. Way to go. The main question that I'd like answered is why is Jimbo so mad at miners? They really get inside his head don't they. 4 times in the same system is clearly harassment. Actually it's a very wrong statement. CCP specifically explained in form posts that to harass player you need to follow him for an extended period of time after he made a special effort to avoid you (and moving to a different belt or making couple of jumps does not count as attempt to get away). So if miner stays in the same system only to experience the same gank, he's clearly not making an attempt to avoid confrontation and as such can't claim harassment. Can I put a bounty on the miner so it is no longer harassment but bounty hunting? EVE is a "MiNInG Universe"!!! The status of unlocked "Gecko " drones (at the time i posted this ) at mining 73.31%; while isk destroyed is 49.32%. If this isn't a sign the new order needs moar gankers, I don't know what is. A single miner in a retriever is so dangerous, that you "redpen" him? 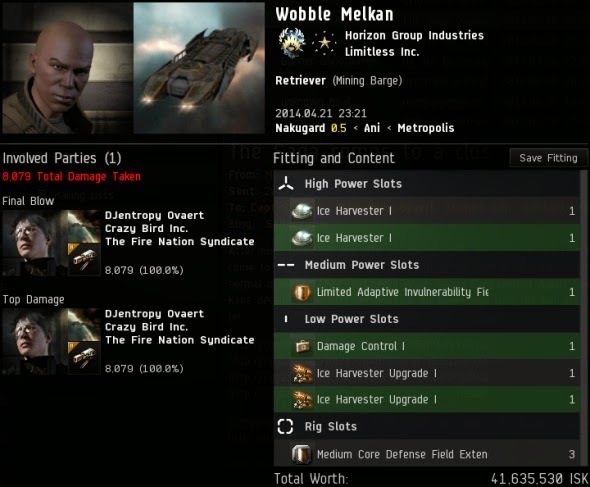 As he stayed in the system CCP wan't take multiple kills as harrasment, BUT putting his name somewhere where he can and will be followed by one or more of your sorry bunch is. You'd love it if the story went that way, I am guessing. Me as the horrid internet bully, Wobble as the poor helpless victim, and our "sorry bunch" following Wobble around and destroying him over and over. Did you bother to take a look at Wobble's killboard? Since his experience with me, he has not taken a single loss - and had you bothered to check the killboards, you would see that this story happened nearly a month ago. Please, sir - check your facts before making wild assumptions. 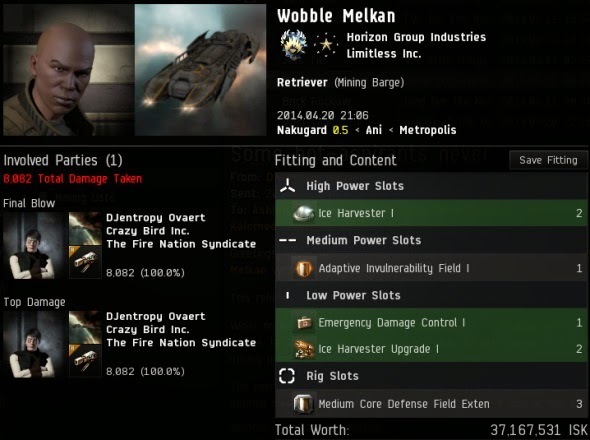 The reality of this story is that I still see Wobble from time to time - in a properly tanked Procurer, aligned to a warp out, and paying attention to what goes on around him. Thanks to his experience with emergent gameplay, Wobble has learned that if he takes the time to defend himself and show some basic awareness of the situation around him in space - he can make himself a very tough target to shoot down, one that would literally require me to call in at least six or seven friends to take out. My campaign in Nakugard has resulted in many permit holding miners, many miners switching from untanked ships to ships with decent defenses, and even some of the miners calling in freinds / logging in alts to defend the ice belt in combat ships. I'm sorry if the facts of this story don't fit the narrative you want to paint. This is what CCP calls "Emergent Gameplay" - and this is why EVE is wonderful. When you read part two of the story you will see how Wobble's actions resonated to the other miners of Nakugard, and how this one situation sparked an entire arc of player created content. I hope you enjoy the read, it will be a good one! DJ, wait, you're saying miners CAN defend themselves?!? I forgot especially when he does that thing that CCP tells Newbies what to do with codies: ignore them! I'm not "bullying" anyone. Eve is a video game, good sir - and in this video game about exploding internet spaceships I play a character who likes to fire on internet spaceships and watch them explode. To equate my actions to "bullying" is akin to claiming that shooting other players in a game like Halo or Call Of Duty is "bullying". 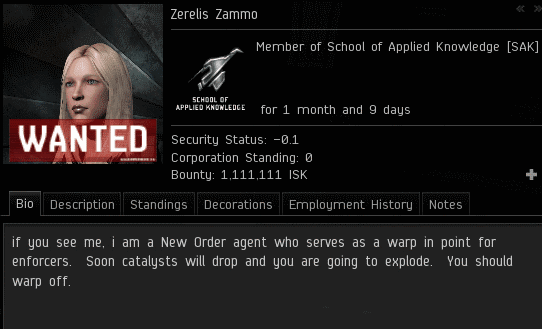 Like everyone who has played Eve online for more then a few months, I've been on the receiving end of attacks as well. But, as a well adjusted and normal human being - I don't call my attacker names. They get a "GF" in local. I have met many of my best friends in this game by destroying them, or being destroyed by them. I hope you take this to heart before throwing a word like "bullying" around again. Words have meaning, good sir. Choose the right ones. Established players who get Eve generally say - "Shooting ships in a space ship shooting game isn't bullying or harassment." New players who don't start shooting ships early enough believe the opposite simply because they believe (rightly or wrongly) the cost of ship combat is extremely high. While it can be it does come down to flying what you can afford to replace. A new player that doesn't get introduced to the combat aspects will always be afraid of PvP simply due to the annoyance of replacing ships, mods and ammo/drones. I'd love to come back to Eve and start training new players. First thing - set up the overview properly. Train combat skills, this helps in PvP and higher PvE content, including level 4/5's, Wormholes etc. What ever EvE is, you can and do bully other people. It might be tolerated, but its still bullying. PPL playing Halo, CoD or Battlefield (i do play BF2-BF3-BF4) dont have such psoosible gametargets. EvE has. You cannot compare those games for your thing. Check this out, you obviously want to ignore the facts: Mining IS a valid and supported gamestyle in EvE. Oh and the miners are closer to fullfill their target than you guys. So yes you can bully in a videogame, thats what your are doing. You can not be so well adjusted as you like since you try to twist things in you favor. Thats a thing all PvP maggots have in common. I call players that ONLY gank others because of their incapability and arrogance "PvP Maggots" and i repeat "Ganking is Bullying"
Hey try shooting harder targets, you will notice, its more fullfiling and respected. Someone who provokes other people and then try to act indignent, disgust me. Especially you Mister (you are no "sir") You are beeing rude, you bully people, so people are rude to you. Its not their flaw, its yours. You sound like you have issues separating video games from reality. Nobody in EVE is defenseless unless they choose to be. And nobody gets a pass to be rude because they chose to be defenseless. I've recently been involved in some Wardecs, while some enemy pilots were slightly rude in not offering GFs after fights (let's face it, they were probably afk) some pilots have been sporting chaps who have continued to throw ships at us and have pleasant conversations. We give them tips, and they adapt and come at us again. They do seem a little slow, but they certainly aren't rude. Mining is a valid playstyle, yes. A playstyle which involves a) mining inside the Eve universe where b) some people like to blow up miners at considerable penalty to themselves which c) causes your ore to have some value. Mining in a safe playpen where anyone can infinite mine at no risk but for some reason this does not devalue your ore *is not a playstyle that exists*. If you go out in the rain and get wet you are not being bullied by clouds. Either get wet, or buy and use an umbrella. The mining mechanic of Space Engineers is vastly superior to that of Eve Online's version. But Space Engineers is not a pvp game. Because Eve is an open ended PvP game, mining (no matter how boring and soul destroying it is to do) is important to the economy and therefore 'worth' doing. This doesn't mean you have to or should be in a bubble away from the rest of the players. "Check this out, you obviously want to ignore the facts: Mining and GANKING are a valid and supported gamestyle in EvE. " Anon @ 2:26 - Other people have addressed your comments pretty well, so there's not much for me to say. As for my "provoking" players by shooting at their spaceships in a game about shooting spaceships, I have a quote for you that I think sums up the insanity of that position quite well. Player vs. Player conflict and combat is at the very heart of Eve Online, and when a player finds themselves immersed in this type of user created content - I feel you can tell a lot about a person by how they respond. Most of the time, after I destroy a target in combat - that target will either remain silent or chat with me and give me a "Good Fight!" or ask questions about how I managed to destroy them and what they could have done differently to have prevented their destruction. I offer advice and fitting tips to such players freely - I really enjoy EVE and I love discussing game mechanics. These players tend to be able to type in complete sentences, and seem to be well rounded adults playing a video game that they enjoy. Then, there's the other side of the coin - the players that feel that having their spaceship destroyed justifies anything they say or do from that point onward. They tend to rage in local chat, cry about how EVE is unfair, issue RL death threats, make insane homophobic remarks and make local chat look like the ravings of a lunatic. These types of players tend to be unable to carry on any form of conversation, usually cannot spell or get across any type of communication that makes any sense whatsoever, and they strike me as much younger, immature, and generally socially inept gamers. These are the same people who probably rage and throw their console controllers at the screen when they have a hard time in a game, or find themselves screaming and crying over video game content. I have no time or patience for these people. That's the biggest factor that makes me support the New Order. Most gankers I've interacted with have been pleasant and friendly. Many highsec miners I've interacted with have been defensive, hostile, rude, crude, and generally not worth communicating with. I enjoy spending my playtime interacting with reasonable adults with a sense of humor, not angry children who really don't belong in a game like EVE in the first place. The problem with this, is that once you violate the EULA by using offensive language and giving real life threats against another player - you don't get to claim you were "only roleplaying". This is clearly stated in the EULA you accepted when you first installed Eve Online. Aside from that minor technical detail, your plan seems quite solid. "If I cuss, threaten and insult your character" clearly indicates exactly that, in-game. If I say I'm gonna find you and kill you, it means goo time. Yes, but there is a difference between "I'm going to hunt you down and kill you" and "I'm going to come to your house and shoot you in the face" and "I hope you get cancer in real life" and "I hope your daughters are raped". Hopefully we both see the difference in these. Sure, but any intelligent person knows that when you tease an animal behind the glass at the zoo, the animal is wishing the glass was gone so it could rip your face off. Point is, if you piss off enough ppl in an "internet spaceship game", don't be surprised when some of them wish you harm in RL. After all, there is a real person behind the toon that is tormenting them. I won't argue about the eula or pvp in eve, but maybe try not to take so much glee in seeing real people suffer (as many of your members do). It seriously makes you look like a perverse human being.